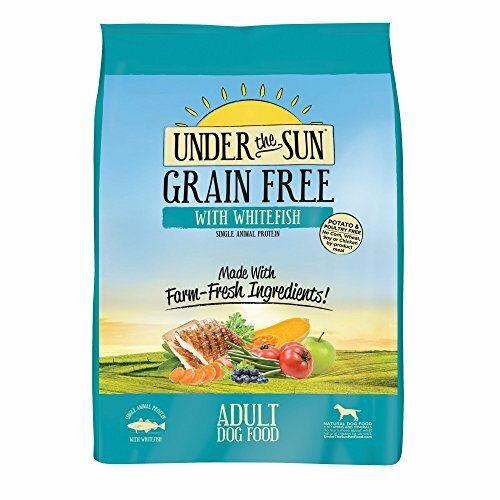 Under the Sun Grain-Free Dry Dog Food is manufactured by CANIDAE® in their own production units. They maintain a strict quality control over all their products, and their dog food is packaged in recyclable materials. The dry dog food uses only the best natural ingredients and comes in several recipe varieties for large dog breeds, small dog breeds, and puppies. CANIDAE® produces their dog food in small individual batches, so it is normal to discover that the kibble from a new bag of dog food is somewhat different in size, shape, or color from the kibble of a previously used bag of dog food. What remains consistent is the taste and nutritious value of the Under the Sun Grain-Free Dry Dog Food. 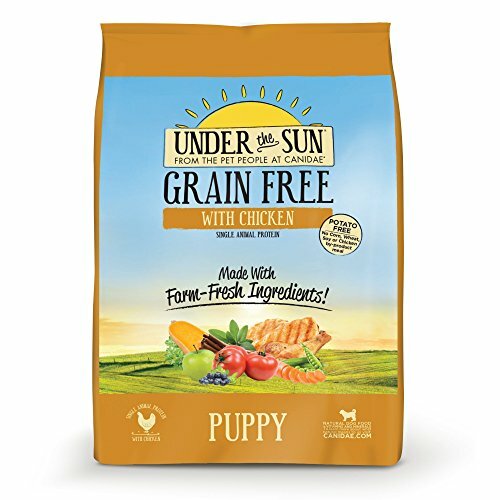 The main ingredient in Under the Sun Grain-Free Dry Dog Food is beef, lamb, chicken, turkey, or fish, along with vegetables and fruits, and these limited ingredients are easy to digest for most dogs. This dog food does not contain any artificial colors and preservatives. The absence of grain, which is often used as filler in many dog foods and which many dogs find difficult to digest, is a boon for pet parents that have dogs with food sensitivities and allergies. This dog food won’t cause skin problems and digestive upsets in your pet, and the dog food is in an affordable range too for most people. Ascorbic Acid, Apples, Biotin, Blueberries, Brown Rice, Butternut Squash, Carrots, Calcium Pantothenate, Canola Oil, Chicken, Chicken Fat, Chicken Meal, Chickpeas, Choline Chloride, Cinnamon, Copper Proteinate, Copper Sulfate, Ferrous Sulfate, Flaxseed, Folic Acid, Green Beans, Green Peas, Iron Proteinate, Lamb Meal, Manganese Oxide, Manganese Proteinate, Manganese Sulfate, Millet, Milo, Mixed Tocopherols, Natural Flavor, Niacin, Oatmeal, Parsley, Potassium Iodide, Pumpkin, Pyridoxine Hydrochloride, Riboflavin, Rice Bran, Rosemary, Sage, Salmon Oil, Salt, Sodium Selenite, Suncured Alfalfa, Thiamine Mononitrate, Tomatoes, Whitefish, Whitefish Meal, Yellow Peas, Vitamin A Supplement, Vitamin B12 Supplement, Vitamin D3 Supplement, Vitamin E Supplement, Zinc Sulfate, Zucchini. Dogs with food sensitivities generally do not react well to a sudden change in their diet. If you completely switch from the food they are accustomed to, they are likely to suffer from health issues. To avoid complications, it is best to transition from one food to another gradually over a period of seven to ten days. Introduce a small amount of Under the Sun Grain-Free Dry Dog Food into your dog’s regular diet, and see how your dog reacts to that. If your dog is able to easily digest the new food, you can increase the food portion and check again. Go on increasing the food portions and checking for your dog’s reaction, while decreasing the portion of the previous dog food. Finally, once you are sure that the new food is not wrecking havoc with your dog’s digestion, you can feed your pet Under the Sun Grain-Free Dry Dog Food in entirety. CANIDAE Under the Sun Grain Free Puppy Food with Chicken, 4 lbs. Pet parents should refer to the daily feeding guide printed on the dog food package to know how much of it they need to feed their dog. You can feed your dog once a day or more times. If it is the, you will have to divide up the daily food amount into the required number of portions. Keep in mind that each dog has a different metabolism. So take the guide as a guide, not as something unalterable. Observe your individual dog and assess how much they need to eat on a daily basis to stay healthy and thrive and adjust the suggested food amount accordingly. Let your dog have access to plenty of fresh drinking water. 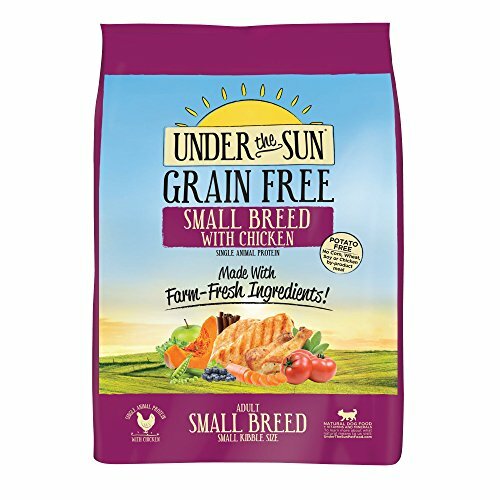 Store the unused Under the Sun Grain-Free dry dog food in a cool, dry place, and always check that it doesn’t develop mold. Opened packages of dog food generally need to be consumed within three months. Canidae has a reputation for producing high-quality pet food that is made using fresh ingredients. All the different varieties of Under the Sun Grain-Free Dry Dog Food meet the nutritional standards set by AAFCO. They also set store by high food safety standards, and have had only one instance of pet food recall instance so far, in 2012. There has not been an issue since, but concerned pet parents should periodically check the FDA’s pet food recall website to make sure that the dog food they are feeding their pet hasn’t featured there. On the whole, many pet parents appear to be satisfied with Under the Sun Grain-Free Dry Dog Food. According to them, Under the Sun Grain-Free Dry Dog Food is tasty enough to appeal to their dogs’ palates and easy for their dogs to digest. Their dogs have shown improvement in their general health after being put on this dog food diet, and are more active and alert than ever before. If you have a dog with food sensitivities, you should consider giving this dog food a try. Please also make sure that your dog also gets some amounts of actual fresh fruits, vegetables, and meat in their daily diet.